Recorded in many spelling forms including Harrow, Arrow, Aro, Arro, Ero, Errowe, Orrow, Orro and Orowe, this surname is either English or Scottish. It is of locational origins, from the places so called in the county of Middlesex in England, or in Caithness near Mey in the far north of Scotland, or from from another now "lost" medieval place near the city of Stirling in Perthshire. The places all share the same derivation, which is from the Old English pre 7th Century words "Guminga-hergae" meaning a heathen temple! 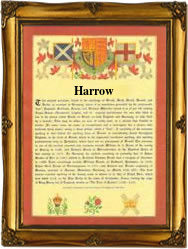 Harrow in Middlesex is first recorded in the famous Anglo-Saxon Chronicles of the year 825, and as later as Herges in the Domesday Book of 1086. As to how it transposed to the modern spelling is something of a mystery. Early examples of the surname recordings taken from early surviving church registers include the marriage between John Harrowe and Annis Townes on the July 10th 1598, at the Church of St. Andrew's Enfield, Middlesex, Joane Arrow at the church of St Andrews, Holborn, on October 10th 1614, and Robert Erowe at St Dunstans in the East, Stepney, on September 23rd 1632. In Scotland the first recorded spelling of the family name is believed to be that of Robert Harrow, given as being a burgess of Stirling, who probably exceeded his duties by taking part in an attack on the river fisheries of the abbey of Cambuskenneth. This was was dated 1366, during the reign of King David II of Scotland, 1329 - 1371.